I feel I should only approach Oscar Gamble, one of the most memorable figures for us baseball-loving children of the 1970s, in a state of absolute clarity, ready to script transcendent odes to his afro. 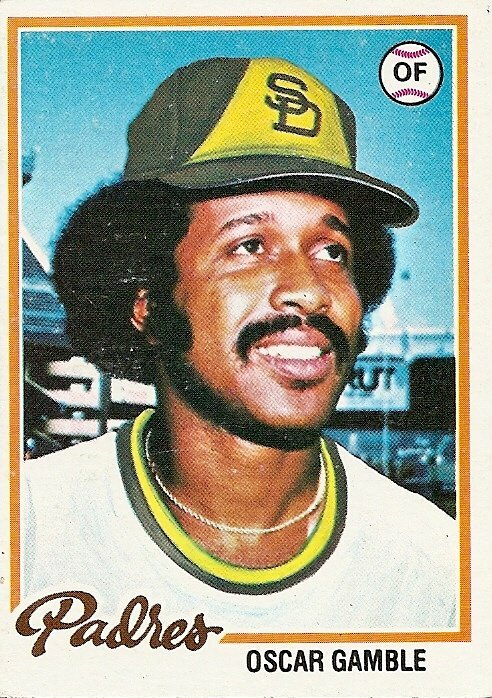 But since I’ve been at this project of writing about all my childhood baseball cards for quite a while and have yet to write about Oscar Gamble I can only deduce that such states of absolute clarity never exist. No matter how I try to capture Oscar Gamble in words I’m going to blow it, so I might as well get it over with on a nothing morning, a Tuesday after a short vacation, no inspiration or even curiosity in my mind, just a low-level sense of unease that the delayed work week is about to fall on top of me like a collapsing abandoned circus tent. It’s a day without possibilities, a day without magic, a day to remain silent, reaching for nothing. But there’s Oscar Gamble. There’s always Oscar Gamble. In the five heaviest years of my baseball card collecting Oscar Gamble played for six different major league teams. You could never tell for sure where he was at any given moment, so there was always a chance he could appear from anywhere. Maybe even a nothing day has the possibility of his appearance in it. No matter where you are or what you are doing, Oscar Gamble might appear, his swing wicked, jagged, able to wrench pinch-hit homers into the right field seats, his afro billowing below his crushed-down batting helmet as he circles the bases, unfurling to its full magnificence when the batting helmet is removed on the walk from home plate to the dugout, big enough to blot out entire dying galaxies in the sky. His afro! There is hope! Here the caretaker of that famous life-affirming coiffure is shown in two places at once, his doctored home Padre uniform suggesting San Diego while the Brut (by Faberge) sign behind him declares the location of his home stadium as Chicago’s Comiskey Park (update: as pointed out by astute readers in the comments below, it is actually Yankee Stadium). If Oscar Gamble can be both here and there then maybe he’s everywhere. Even when I’m nowhere. 1. The park in question on both cards is the then recently constructed Yankee Stadium II. Despite having been to about a hundred games there, and despite distinctive Yankee Stadium II features like the facade, Monument Park, the blue outfield wall, and the RF pedestrian ramp appearing in the cards, I don’t think I would have bothered verifying the identity of the stadium unless you had pointed out the Brut ad. I don’t recall anything about my first visit to Yankee Stadium except that Brut ad and the plastic batting glove I got as a souvenir. I bought a bottle of Brut after that first visit because I was under the impression it was a very expensive soda. 3. Yep, Yankee Stadium. By then the distinctive “Kodak” sign that is present in many of the 1973-1975 cards has been moved or replaced. Gotta love those old Padre Uni’s! I wonder how many years of art school the artists at Topps had to have in order to airbrush hats and Uni’s like that. Keep up the great writing. It’s great and a fantastic trip through memory lane. 4. And can we forget Mrs. Gamble’s painful rendition of the National Anthem before a World Series game while he was a Yankee? I can’t. 5. This airbrushing is much improved from the previous season’s YANKEES TAKE A GAMBLE ON OSCAR traded card. They never got the color or logo right on the Yankees ones. I just looked up his stats and realized he was a better player than I thought he was. 6. All bow down before that fro!! I don’t know what you call that stuff that rings the stadium, but it’s distinctive. I paid my final visit to Yankee Stadium II over the weekend. Being a native Nutmegger in Connecticut, I’ve never been a fan of the Yanks, but I’ve followed them more than any team other than the Red Sox. 7. I agree that Gamble could always take a nothing day and suddenly make it all seem worthwhile. 8. That’s such a mild version of the Gamble ‘fro, nothing compared to when he was with Cleveland. I always loved Oscar. Not only was he a fine hitter, he always looked like he was having a great time. I love watching a guy who has fun playing baseball. At the time, I heard that he was sometimes known as “Doc,” because he was a self-proclaimed Doctor of Hittology. 9. Ugh, feeling stupid about the misidentification of the stadium. There are so many White Sox posing in that exact place in cards that year that I assumed it was their park, but of course it’s Yankee Stadium. Fitting that Gamble is shown there, as he, a powerful left-handed pull hitter, was made to take shots at the short rightfield porch there. 10. I’m wondering why a National League Padre is taking a picture in American League Yankee stadium? An exhibition game during the preseason? By the way, I am working on a sweet jewfro as we speak. 11. I’d love to see a “top 10 worst airbrushes by Topps”. This one isn’t bad, but Lord, there’s been some horrid ones. I picked up a pack of Topps last year and they had a Piazza A’s card that I had to look twice at. It was airbrushed, but you really couldn’t tell. They’ve come a long way. 12. 10. Airbrushed photo, he was playing for the White Sox when the picture was taken. 14. 10 Sorry guys, that was a bonehead comment by me. I realize the idea of the post now that I have woken up a bit and re-read it. When I first get into work and flip the computer on, it takes a bit before the cobwebs clear. 15. Of all the people in the world who I wouldn’t have thought wouldn’t know all about the Brut sign due to its prominence on cards over the years…. but of course, you are forgiven–and besides, it may have made Yankee fans feel like their stadium is less important, which is always a good thing. 16. yeah that ’76 Topps “Traded” card is definitely a classic; the enduring image that stays with me when the words ‘Oscar Gamble” are uttered. 17. 15 : The amazing thing is that the location of that Brut sign was previosuly identified on this site (in the comments for the Ron Schueler card). Dipshit = me. 16 : It really is quite a card. A glaring absence in my collection. 18. 15 Not this Yankee fan. If that Brut ad somehow went on the block when the Yankees have their yard sale in 2009, I’d be all over it. Either that or the Maufacturers Hanover ad (SUPERCHECKING!). I’d wallpaper my living room with it. It’s a laser accurate artifact from a very particular era in Yankees history. 19. Only played one year for the Yankees. Had a pretty good year. They traded him to the White Sox for Bucky Dent, giving Mr. October the right field job. 20. 19 : After playing one year for them in ’76, he came back to play for them for 5 additional seasons (1980 through ’84). He came back in a deal that involved Mickey Rivers. He came back and played for the Yanks from part of 79-84. 23. Oh, and vockins–I was actually implying that since Josh forgot about the sign, it might make you feel like, “Aw man, our stadium’s features aren’t as memorable to others as I thought!” I wasn’t knocking the Brut sign–this Yankee-hater loves the Brut sign. It’s from “my day” as well. 24. Oscar Gamble – after his 31 homers in ’77, as a Dodger fan I thought that he would romp for the Pads and held my breath every time he went to bat against the Dodgers. Then when the Yanks picked him up I knew that he must be destined for greatness. I always see the logos for Oscar-Mayer, Proctor & Gamble whenever I see or hear his name. 25. 22 Superman never stopped being a familiar brand name with a familiar logo.